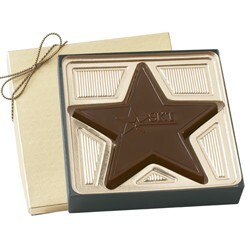 Custom Chocolate Star Award. Every achievement, no matter how small, deserves a chocolate award. We offer a collection of sweet rewards for a job well done. Choose from our selection of awards to personalize and mark that special event. Choose Milk or Dark Chocolate. The 2.5 oz Star includes a choice of Gold or Silver Box. Blank goods are available with no setup charge for chocolate. The imprint area on the 2.5oz Star is 1 3/4" X 1 3/4". The imprint area on the box is 4 1/4" x 4 1/4".